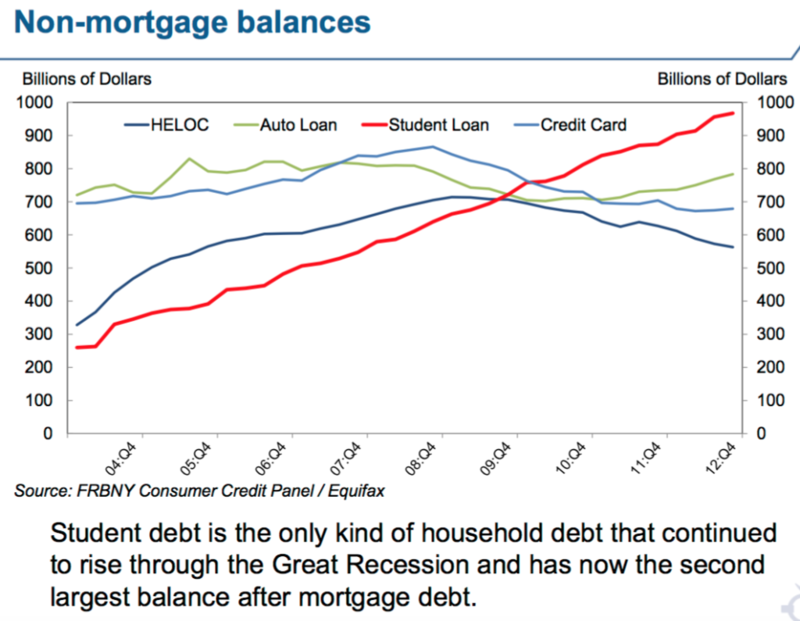 USA Student Loan data are not as easy to pin down as our total National Debt (~$19.3T) or the amount we owe the Social Security Trust Fund (~$2.8T) or even total household debt (~$12.1T), but it is clear that Student Loan Debt, now at about $1.3T is the fastest growing. Anyway, my apologies for the charts at the bottom of the post. They are the best I could find, and I didn’t find any good place to download raw data. Click on them for a link to the source. Student loans have been around since 1958, and I got my first and only in the spring of 1964. I was a senior chemical engineering student at Vanderbilt University, Nashville, TN, graduating in just a few weeks, debt free, at the end of four years with a full tuition scholarship worth about $900 a year. I had a $550/month summer job lined up at West Virginia Pulp and Paper, Covington, VA, and a $200/month fellowship to get a masters in chemical engineering at the University of Tennessee beginning in September, 1964. One other detail: Karen and I had set our wedding date for September 11, and had sprung for a $212 Orange Blossom diamond engagement ring at Christmas. I was pretty financially responsible, though not very savvy, and was a bit worried about how the budget would work out for the next fifteen months or so. Well, we could always eat with her parents or mine, and I was pretty confident that once I got the masters and accepted one of the many jobs that would be offered, we would be wealthy. That was a false hope. I was always a little short of cash, it seemed, so, I applied for and received a $500 student loan, agreeing to pay it back over the following ten years at a rate of $50 per year plus 3% interest. Vanderbilt had no interest in the intended use of the money, but it certainly wasn’t to pay college bills. I’m not sure where the money went, but the rings were paid for, gas was $0.30 a gallon, and the honeymoon in a State Park cabin was less than $100. I do recall showing up completely broke for my first, and last, full time job at Eastman Chemical Company, Kingsport, TN, in September 1965. This little incident provides some insight into typical economically and financially destructive mindsets about federal funds and federal spending, especially when non-profit organizations are involved. Apparently, Vanderbilt had been allocated a certain amount of money that could be loaned, and they were going to loan it whether it was needed or not. After all, they might have been allocated less in 1965 if they didn’t use all that was available in 1964. 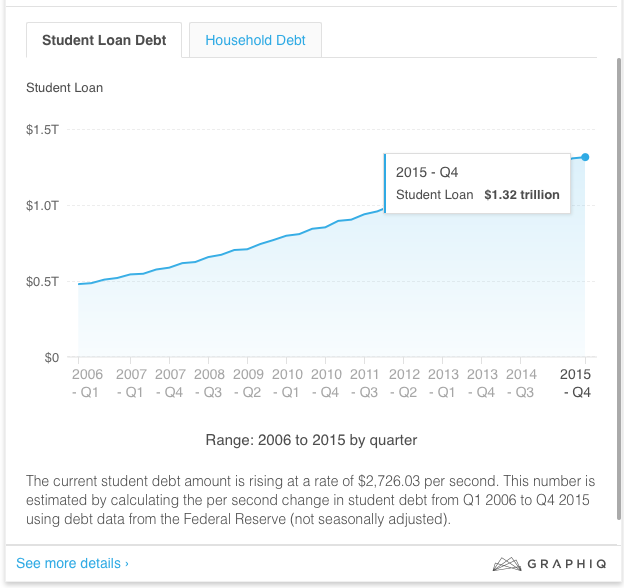 Now, with the elimination of FFEL and return of direct, never say no, government funding of student loans, combined with a weak job market and lagging pay, we are seeing a distressing increase student debt and default on the same. There seems to be a proliferation of “colleges” lined up seeking students to apply for the loans. And, we see tuition increases going along with the increasing lending so that the only net effect will be higher debt loads for graduating students. Created money chasing goods and services always drives up prices of those goods and services. A word to the wise: Don’t let your total student loans exceed one year of normal starting salary for recipients of the degree you are working toward. To be more specific and even more stringent, if your college goal is as non-specific as an “interdisciplinary degree in religious and women’s studies,” and you or your parents don’t have the money to pay for it, either forget it or work your way through college as millions have in the past decades. Don’t let the government, or some college, talk you into debt that will burden you for decades because if you take the kind of job such an education normally leads to, you are going to be struggling financially for a very long time. You may have hope that the government will change its policy and not require you to repay the loans, but my hope is that your hope is a false hope.